Paul Robeson is best known as a world famous athlete, singer, actor, and advocate for the human rights of people throughout the world. Over the course of his career Robeson combined all of these activities into a lifelong quest for racial justice. He used his deep baritone voice to communicate the problems and progress associated with black culture and community, and to assist the labor and social movements of his time. He sang for multiracial and multiethnic peace and justice in twenty-five languages throughout the United States, Europe, and Africa. Robeson was born in Princeton, New Jersey on April 9, 1898, to Reverend William Drew Robeson, the pastor of Princeton’s Witherspoon Street Presbyterian Church, and Maria Louisa Bustill Robeson. His mother was from a prominent local mixed-race family and his father was a former slave who escaped from a plantation before the Civil War. Robeson was the youngest of four children. Robeson’s mother died when he was six and his father struggled to care for the two youngest children. By 1912 the family had moved to Somerville, New Jersey where the young Robeson already was a standout athlete and stage performer. He also preached in his father’s church. In 1915 Robeson became the third African American student to enroll at Rutgers University. There he became an All-American Football player, received a Phi Beta Kappa key for his scholarship, and graduated as class valedictorian. Robeson entered the New York University Law School in 1919 and while there supported himself by serving as the assistant football coach at Lincoln University where he joined Alpha Phi Alpha Fraternity. 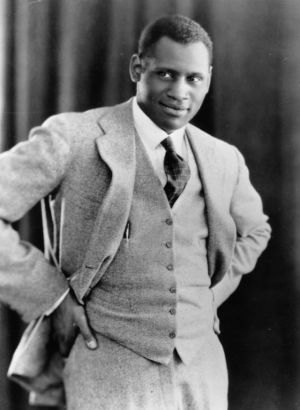 Robeson left New York University Law School in 1920, moved to Harlem, and transferred to Columbia University Law School. He graduated from that institution in 1923 while playing professional football for the Akron Pros coached by Fritz Pollard. Robeson ended his professional football career in 1922. After getting a J.D., he briefly practiced law but decided to focus his career on the stage and screen. In December 1923 he landed the lead role of Jim in Eugene O’Neill’s play, All Gods Chillun Got Wings. Over the next thirty years Robeson built a career in theater and music which he also saw as a way to battle racism. He starred in eleven films, including Body and Soul (1924), Jericho (1937), and Proud Valley (1939). In London, Robeson rose to international fame for his theatrical role in Othello (1944). In 1933 Robeson made film history by becoming the first African American to star in a major studio production, The Emperor Jones. He also took on controversial role such as Bosambo in Sanders of the River (1935). The film made him an international star but it also created a backlash because of its stereotypical portrayal of Africans. From that point, Robeson vowed to appear on screen and stage only in what he considered positive roles. Around this time, Robeson began a decades-long association with the Soviet Union which he visited for the first time in 1934. While never admitting whether he joined the Communist Party, he continued to promote socialism and the Soviet Union even during the height of the Red Scare in the United States. With Max Yergan, Benjamin Davis, Jr., and Revels Cayton, he became one of the most consistent voices on the American Left. During the 1940s Robeson challenged U.S. President Harry Truman to support an anti-lynching law, protested the growing Cold War, and worked tirelessly for friendship and respect between the U.S. and the USSR. In 1945, Robeson openly questioned why blacks should fight in the army of a government that tolerated racism. Because of his outspokenness, he was accused by the House Un-American Activities Committee (HUAC) of being a Communist. The allegation almost destroyed his career. In 1950, the U.S. rescinded Robeson’s passport, leading him to an eight-year battle to regain it and his ability to travel abroad. During those years, Robeson studied Chinese, met with Albert Einstein to discuss the prospects for world peace, published his autobiography, Here I Stand, and sang at Carnegie Hall in New York City, New York. In 1952 and 1953, he held two celebrated concerts at Peace Arch Park on the USA-Canadian border just north of Bellingham, Washington, singing to upwards of 40,000 people in both countries. Robeson made a brief comeback as a stage performer in the late 1950s and early 1960s. He also became involved in the growing civil rights movement in the U.S. during that period but his failing health stymied both his stage career and his political activism. After suffering from double pneumonia and a kidney blockage in 1965 he permanently retired from public life and lived in seclusion in Philadelphia, Pennsylvania. Robeson died in that city on January 23, 1976 following complications from a stroke. He was 77. Paul Robeson, Here I Stand (New York: Beacon Press, 1958); Martin Duberman, Paul Robeson (New York: New Press, 2005); Paul Robeson Jr., The Undiscovered Paul Robeson, An Artist’s Journey, 1898-1939 (New York: Wiley, 2001); Paul Robeson Jr., The Undiscovered Paul Robeson, Quest for Freedom, 1939-1976 (New York: Wiley, 2010).